Champions in this category are organizations or individuals that provided extraordinary leadership resulting in transformative productivity successes for manufacturing companies (more detailed Champions features can be found in the 2018 Champions Yearbook). 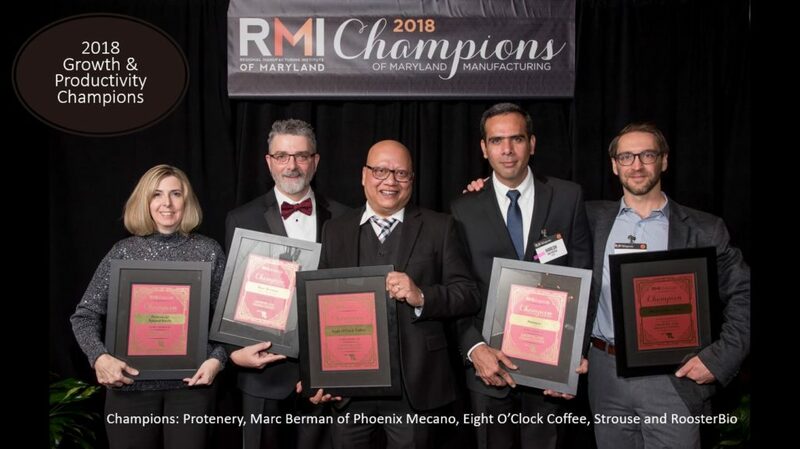 Prince George’s County’s Eight O’Clock Coffee’s performance and productivity highlights include a 27% percent cost reduction in overhead equating to a $2.8 million savings and more than $30 million capital investment for automation within the past few years. Since Marc Berman joined Frederick County’s Phoenix Mecano in 2014 as the Production Manager he has improved production time to plan by an average of 20 percent, reduced router times an average of 15 percent across all operations. Since Dorchester County’s Protenergy opened their doors in 2011, they have grown from producing a million cases a year to 8.3 million cases produced at the end of 2017. Frederick County’s RoosterBio’s products are radically streamlining product development and stem cell-based therapeutics supply chain ushering in a new era of productivity in the field. Carroll County’s Strouse designs and manufactures pressure sensitive adhesive solutions and their growth is unprecedented with revenue gains of 58 percent in the last three years.